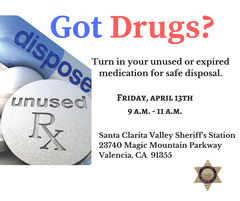 Santa Clarita Valley Sheriff’s Station will be hosting a curbside "Drug Take Back" event on Friday, April 13th. Residents are invited to bring unwanted, unused or expired prescription drugs to the sheriff’s station for disposal - no questions asked. Participants are asked to put medications in a sealed bag for drop-off. The Santa Clarita Valley Sheriff’s Station is located at 23740 Magic Mountain Parkway. The drop-off times will take place from 9 a.m. to 11 a.m. Illicit drugs, biohazard waste, needles and other sharps will not be accepted at the curbside drop-off. Residents may dispose of needles and syringes in the sharps disposal receptacle which is located in front of the sheriff’s station.